Skechers Shape-Ups walking shoes were at the forefront of the toning shoe trend a decade ago. They are updated and continue to be very popular with walkers who appreciate them as comfort shoes. The rocker sole design works well for many people and they are happy that Skechers continues to produce Shape-Ups and other rocker-soled models. Skechers Shape-Ups are similar to the Swiss Masai Barefoot Technology (MBT) shoes, which was one of the original rocker sole designs that aimed to activate and tone more muscles during daily activities or fitness walking. Skechers stresses that the Shape-Ups have a sole with a soft kinetic wedge sole. This sole provides super shock absorption and a slightly unstable walking platform. The rocker sole enforces a good heel-to-toe walking stride with roll through the step. The extra rear extension exercises the leg and buttock muscles in new ways. Skechers recommends using Shape-ups only for shorter walks of 25 to 45 minutes per day until your body has adjusted to them. Skechers Shape-Ups are often extremely comfortable right out of the box. The toe box is wide enough for people who have wide feet. The extra cushioning also make them a great shoe for people who must stand for long periods each day, for whom cushioning and the slight instability might help prevent fatigue. Over the years, people who have foot pain are very divided about Skechers Shape-Ups. There are the fervent fans who say they are the only shoes they can wear without pain. Then there are those who blame rocker soled shoes for their foot pain. However, many of the Shape-Ups designs are heavy shoes. 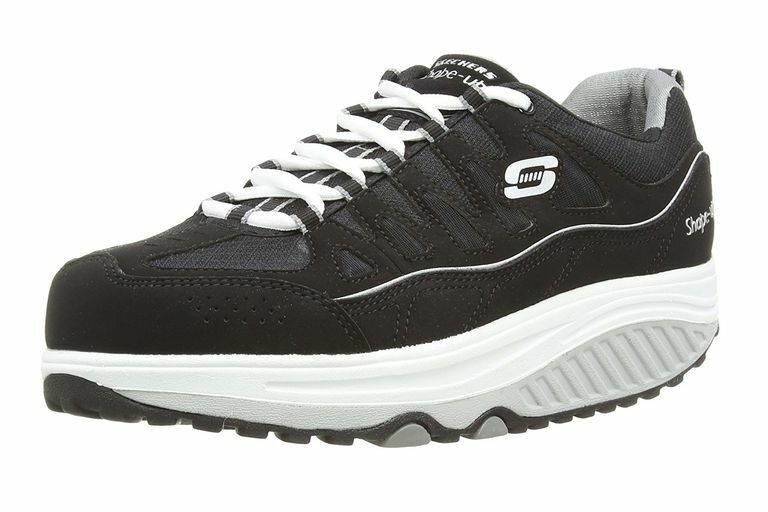 Skechers Shape-Ups 2.0 weigh 11.5 ounces per shoe for a women's size 6, which is hefty. They can be too heavy for some people to wear comfortably. This effect can especially be felt for fitness walking. You may start out appreciating the comfort and cushioning, but soon enough feel some strain from the extra weight of the shoes. For those who normally wear heavier shoes, they might not notice this effect. But those with any knee, ankle or hip problems may feel it. In general, it's best to avoid heavy shoes for this reason. Skechers originally touted Shape-Ups as toning shoes, designed to stimulate more muscles and balance with a rocker sole with a soft kinetic wedge. The rocker sole enhances the natural walking motion of rolling through a step from heel to toe. The sole is designed in three layers with a firm midsole for support and a super soft foam kinetic wedge that absorbs shock with each step and simulates walking in soft sand. This combination sought to activate more muscles to develop balance and posture and tone leg and buttock muscles. Skechers marketed Shape-Ups heavily, even enlisting the Kardashians in their advertising that touted toning and using as part of a weight loss effort. In 2012, Skechers offered refunds to U.S. customers as part of a $40 million agreement with the Federal Trade Commission due to misleading advertising claims for weight loss and muscle toning. Since then, Skechers Shape-Ups continue to be produced in a variety of styles, including athletic versions, dress shoes, sandals and comfort shoes, but without the claims for extra toning or weight loss. Skechers Shape-ups are about the price of a good pair of athletic walking shoes, and less than some other brands of rocker-soled shoes. They come in both athletic and lifestyle styles. They are probably best used as comfort shoes rather than using them to train for walking events. A walker might wear them for a shorter walk each day or every-other day in addition to walking in athletic walking shoes. They provide a different workout from regular walking. Be aware of any joint pain developing that can be a sign of overuse injuries. Skechers models often include those that are lighter in weight and more flexible for a more natural walking motion. Select a retailer that has a generous shoe return policy and be sure to return them if they don't work well for you. Are You Eligible for a Refund on Toning Shoes?